Warm spices combine with licorice root to produce a bright golden infusion with an earthy-sweet licorice taste. 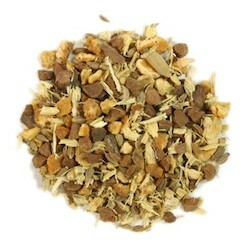 Ingredients: Organic licorice, cinnamon, anise, orange peel, chamomile, cloves. Directions: To enjoy, pour 6 oz boiling water over one teaspoon of tea. Steep 3-5 minutes, strain and serve. Safety Information: Not for prolonged use or in high doses except under the supervision of a qualified health practitioner. Not for use in pregnancy except under the supervision of a qualified healthcare practitioner. Not for use in persons with hypertension, liver disorders, edema, severe kidney insufficiency, low blood potassium, heart disease with edema or congestive heart failure.